Background to the Redfern mural (see Update 5 December below) and teaser for documentary. This link came from street artist Hego, who tweets @artisthego. Australian artist Ben Quilty has an exhibition at the Bendigo Art Gallery until 1 March which confronts colonial denial about massacres. It remains astonishing for Quilty that many sites of massacres of indigenous people around Australia remain unmarked, and without suitable commemoration. At the same time, he is not surprised, given the country’s history of violence, theft, denial and mismanagement around indigenous affairs. That massacre sites can be conveniently ignored continues that trend. Meanwhile, Quilty’s exhibition of paintings depicting soldiers in Afghanistan has commenced at the Australian War Memorial. On the ABC, Lorena Allam presented the story of the 1842 executions in Melbourne of Maulboyheener and Tunnerminnerwait. See earlier material on this incident, which is being commemorated with a memorial. On SBS this time, there was considerable interest in the First Contact program, where unsympathetic white Australians met Indigenous families. Producer Rachel Perkins talked about the program, Paul Daley commented and Amy McQuire noted some concerns felt by those involved. Meanwhile, in Alice Springs, those attending the First People’s Congress claimed that Indigenous views had been hijacked by high profile spokespersons and Paul Daley detected declining political will to change the constitutional position of Indigenous Australians. Finally, we have linked to it before, but Humphrey McQueen’s pioneering writing from 40 years ago on the Frontier Wars deserves to be mentioned again. Honest History distinguished supporter, Paul Daley, has just won a Walkley Award for Coverage of Indigenous Affairs. He won with articles in Guardian Australia on how the Australian War Memorial ignores the Frontier Wars, the trade in body parts of Indigenous Australians, and the hypocrisy in ignoring Indigenous warriors in the Frontier Wars while publicising Indigenous service in uniform. Daley wrote further about these issues, particularly in relation to Redfern portrayal of Indigenous soldier, Alfred Cameron, contrasting it with official treatment of non-uniformed warriors. NAIDOC Week is 6-13 July. The theme for this year is ‘Serving Country – Centenary & Beyond’. The centenary referred to is the Anzac centenary. The word ‘Beyond’ is intended to take us back – back to when Indigenous Australians served their country without wearing the Queen’s uniform, indeed, when they fought against those who wore that uniform – and forward to the future. The NAIDOC website says this about the theme. This year’s NAIDOC theme honours all Aboriginal and Torres Strait Islander men and women who have fought in defence of country. From our warriors in the Frontier Wars to our warriors who have served with honour and pride in Australia’s military conflicts and engagements across the globe. We proudly highlight and recognise the role they have played in shaping our identity and pause to reflect on their sacrifice. We celebrate and honour their priceless contribution to our nation. The words are notable for recognising both uniformed service, by approximately 4000 Indigenous Australians, and the Frontier Wars, where perhaps 30 000 Indigenous warriors, women and children were killed, the most recent in the 1930s. 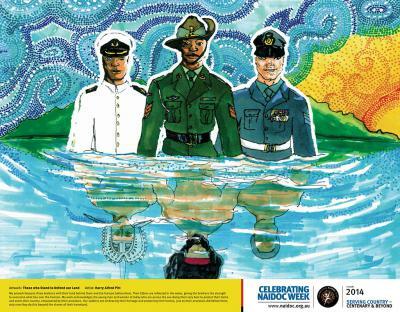 The official poster (by Harry Alfred Pitt, from the Torres Strait) has Indigenous Australian warriors reflected in the water. Still, the most obvious feature of the artwork is the uniforms. The Frontier Wars are further referenced on the lower left of the poster: ’empowered by their ancestors. Our soldiers are embracing their heritage and protecting their homes, just as their ancestors did before them … ‘. On the other hand, there is the work of Amala Groom, a Wiradjuri woman and Sydney-based artist. Amala has provided a statement about the work ARTIST STATEMENT Amala Groom. It includes this claim. To maintain the fiction that Australia was settled “peacefully” the wars fought on the frontier will never be honored. These brave warriors who fought for kin and country will never hold their rightful place in the narrative of the colonial project known as Australia. Their loss of life will never be given the same respect as the loss of the life of the ANZACs, the diggers, the great Aussies who fought under the Australian flag. The thousands of men, women and children who were devastated from the countless massacres and atrocities committed against them will never be dignified by the state. Amala goes on to talk about her work. The use of Western symbology to memorialise the known and unknown heroes of the resistance movement is deliberate. 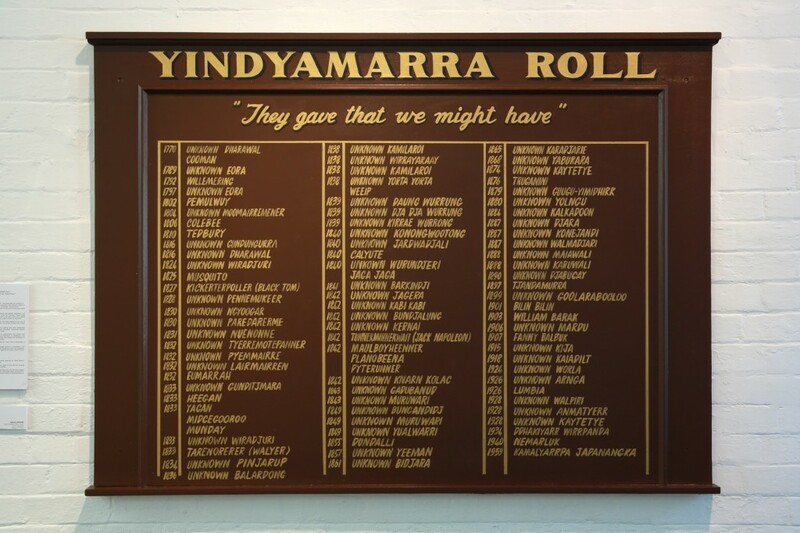 The Yindyamarra Roll is a tribute to those who fought the onslaught of the colonial invasion of their tribal lands. These warriors gave their lives that we might have a language, a lore, a clan, a nation, and a family. The dual references in the NAIDOC Week theme are welcome although one wonders whether the message will be blunted by its subtlety. Amala Groom’s work has a more direct thrust. The different emphases reflect different attitudes among Indigenous Australians. We understand that NAIDOC Week celebrations will commemorate both the dead of the Frontier Wars and those who died wearing Australian uniforms. Meanwhile, however, what non-Indigenous Australians see from official sources is dominated by one side of the story, the recognition of Indigenous service in uniform. This service is being promoted by the Defence Department, the Army, the Australian War Memorial, the Department of Veterans’ Affairs, the Serving Our Country research project and others. Typical of this material is the Army’s section on Indigenous soldiers, which says that ‘Indigenous service men and women have served our nation since the Boer War‘ (emphasis added). It is not for whitefellas and other non-Indigenous Australians to lead a campaign to have Australia adequately recognise the dead of the Frontier Wars, though there are plenty of whitefellas who would support such a campaign led by blackfellas, should blackfellas wish to lead one. Nor is it for non-Indigenous Australians to suggest tactics to Indigenous Australians. Anything that gives long overdue recognition to Indigenous service is welcome. It needs to be asked, however, whether these efforts are intended, by some of those doing the promoting, to divert attention from awkward truths about conflicts where Indigenous warriors did not wear the Queen’s uniform. The stories of the Frontier Wars have been part of the heritage of Indigenous Australians, particularly where family members suffered in incidents or heard the stories directly from those who did. Indigenous Australians also rightly honour the more recent service of their family members in uniform. Both forms of service will be remembered during NAIDOC Week but the fact remains that, for non-Indigenous Australians looking on, Indigenous uniformed service is gaining a higher profile than the Frontier Wars. We are being told – and being told increasingly well – less than half the story. Honest History would love to hear from those who have an opinion on these matters. We have opened the ‘Comments’ function on this page for that reason. NAIDOC stands for National Aborigines and Islanders Day Observance Committee. The NAIDOC Secretariat is in the Strategic Communications area of the Department of the Prime Minister and Cabinet. The co-chairs of NAIDOC are Anne Martin and Benjamin Mitchell. An article in the Guardian Australia by Paul Daley to mark NAIDOC Week 2014, another by Alan Stephens in The Drum, a speech by Timothy Bottoms to mark the Myall Creek Massacre, Henry Reynolds’s book Forgotten War and other material on this website that can be found by searching ‘frontier wars’ and ‘Indigenous servicemen’ plus this compilation. Also Mick Dodson on Indigenous servicemen. Mick Dodson and John Maynard on indigenous servicemen. Peter Stanley speaks at NAIDOC function at ADFA. Frontier Wars commemorated in Western Victoria. And again. Celeste Liddle expresses unease about the tone of NAIDOC Week. Jeff Sparrow on Frontier Wars. Wrap up on Croakey blog. Paul Daley and Cameron Atfield on new estimates (revised upwards) of deaths in Frontier Wars. Nakkiah Lui wonders if NAIDOC Week has become a con job. Celeste Liddle on long struggle for recognition; comparisons with Aotearoa New Zealand and the United States. Santanu Das puts the Indigenous service issue in context by noting the commemorative neglect of the Empire’s colonial soldiers and Elizabeth Rechniewski considers the story of Indigenous soldiers in World War I across a number of countries. Anthony Dillon discusses Indigenous issues in the context of NAIDOC Week. Wendy Frew on research into black Diggers. An ABC program in September 2014 on black Diggers. An alternative view from Joe Lane on the stolen generations, publicised by Andrew Bolt and John Ray and in The Australian.